1. A person who ousts or supplants someone else. 2. The act of removing or forcing somebody out of a place or a position: "The army general was involved in the ouster of the head of the country's government." 3. The expulsion or removal from a position or place being occupied by someone: "The opposition party called for the ouster of the cabinet minister." 1. 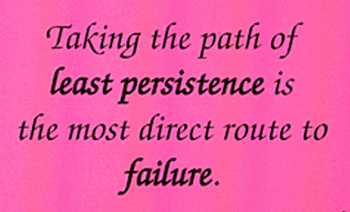 To keep carrying on, to continue steadily or obstinately despite problems, difficulties, or obstacles. 2. 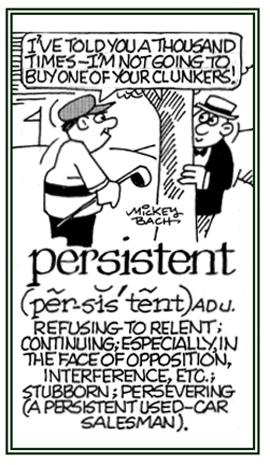 To be obstinately repetitious, insistent, or tenacious. 3. To hold firmly and steadfastly to a purpose, state, or undertaking despite obstacles, warnings, or setbacks. 4. To continue being widely believed or accepted despite evidence or proof to the contrary. a view that persists to this day. 5. To continue happening, lasting, or existing. 6. Etymology: existing since 1538, from Middle French (about 1400-1600) persister, from Latin persistere, "to continue steadfastly"; from per-, "thoroughly" + sistere "to come to stand, to cause to stand still". 1. The quality of continuing steadily despite problems or difficulties. 2. To go on resolutely or stubbornly in spite of opposition, importunity, or warnings. A staying or continuing quality. 1. Referring to someone who is being tenacious or determined despite problems and difficulties: Sally has been a persistent worker in striving to achieve the company's objectives. 2. Pertaining to something which is incessant or unrelenting; existing or continuing for an unpleasantly long time: Extremely bad weather conditions have been a persistent problem in many parts of the country this winter. 3. Descriptive of something that is constantly repeated or continued: Many carpenters have been making persistent efforts to repair the damage done by the recent tornado. © ALL rights are reserved. To continue to exist past the usual time, or to continue to do something in a determined way even when facing difficulties or opposition. 1. Temporary sequestration of a portion of the blood from the general circulation by application of tourniquets on an extremity. 2. Stasis in a vein due either to pathological venous distension or as a result of the application of a tourniquet. 3. Compression of veins temporarily to restrict an amount of blood from general circulation; bloodless phlebotomy. Stasis refers to the stoppage of the normal flow of fluids; such as, of the blood or urine, or of the intestinal mechanism; stagnation. Showing page 13 out of 22 pages of 319 main-word entries or main-word-entry groups.